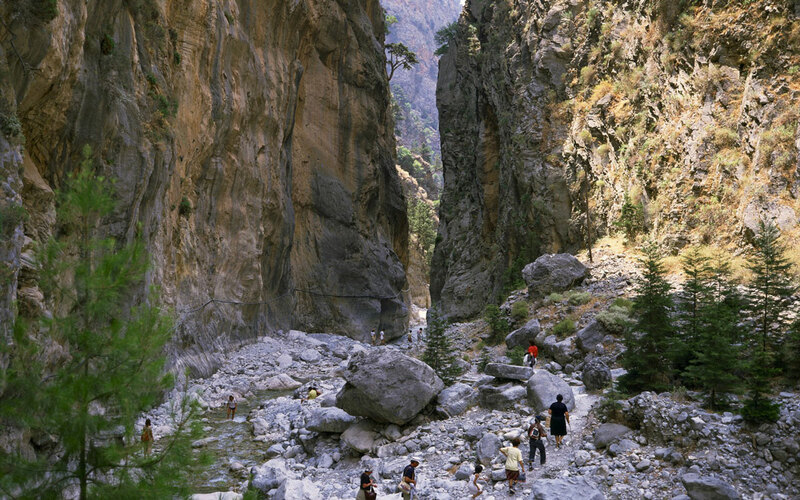 Samaria Gorge is the longest gorge in Europe and its distance is 16 km. It is open from May till October according to the weather and the water in the river. If you are thinking of doing it, so have a look at the prices of the local agency, they are usually cheaper and better than the tour operators. GS Tours is a good alternative. You can also take the local bus from the bus station in Chania. You have to pay the entrance fee at the start of the gorge and the boat. It is a wonderful day trip if you can manage the walk. The trip up to Omalos is gorgeous and the boat trip either to Hora Sfakion or Sougia is a treat after the long walk. Then you have the trip back by bus from a different route. You see a lot of the island’s landscapes and come back at night. There is water sources inside the gorge, so you only need a bottle of water from the start, and refill it during your walk. You can get snack from the shop at Xiloskalo for your walk. Everyone starts early in order to reach the last boat from Agia Roumeli at the end. The nature is majestic through the gorge. 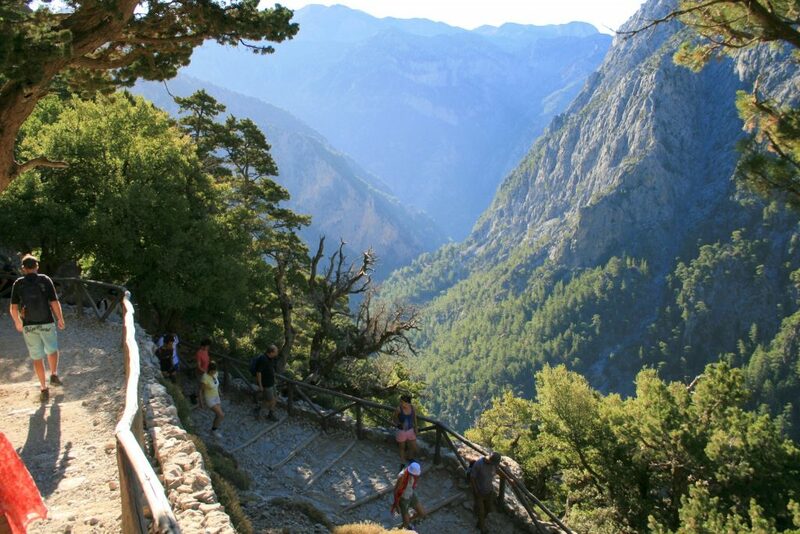 Some people leave the car in Xiloskalo and go a little down the gorge, other starts from the end in Agia Roumeli, and walk to the village Samaria and back again. The whole walk is long, but not difficult. Remember that there is only stones and it wears out the shoes. Good footwear is so important. It takes you from 3-6 hours depending on you physical strenght and legs. It is a natural protected park and the rules are strict. No one is allowed to stay in the gorge at night, and there are guards throughout it to look out for the nature and the wild Kri-Kri a wild goat that only lives here. At the end of the day, everyone have to be out of the gorge. The river can be dangerous if it is full of water, so they look after it in bad weather. Why is it so popular? If you walk in July/August it can be like walking on a highway. Thousands are arriving every day at the top of the gorge, all through the season, and you find them in the end in Agia Roumeli in the late afternoon. The same buses that bring you to Omalos in the morning, pick you up in the evening. Greeks will always do it, because it is very famous in Greece, and the locals of course. I have met many Americans that visit Crete only to see Knossos, the old Venetian Harbour of Haina and walk the gorge! In my opinion there are some other gorges that you could do, if you are not in the best form. Agia Irini and Imbros are two of them, shorter and as beautiful as Samaria!! Many people have signed up to the trip, are not realy up to it. Either with wrong footwear, no physical strenghth. If you have shoes with a thin sole, you will end up without any, and with very sore feet the next day! I have seen all kind of shoes from flip flops, tennis shoes and old sneakers. Be sure to wear a backpack with your stuff!! 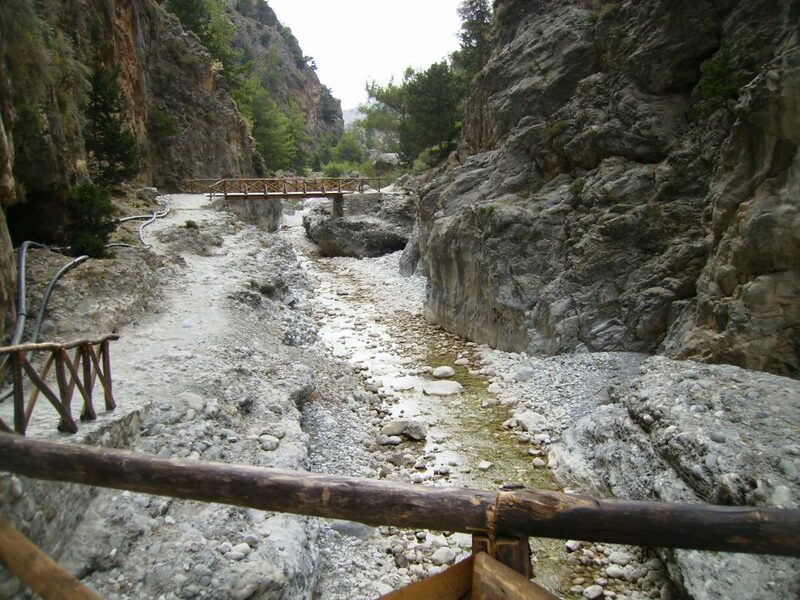 If you of any reason can not make the whole gorge, there are donkeys and mules with local men to take you to the end. Mind that you can get seasick from that!! 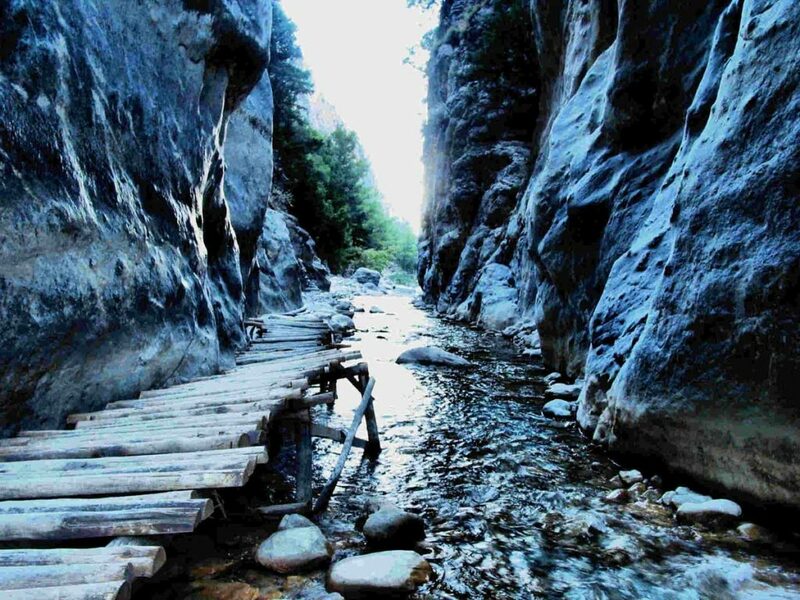 The gorge is not really difficult as I already mentioned, but you will walk down on a stony path for 2 km. Going down for so long is a strain on your legs and knees. You have to look carefully where you step! Most people don’t get out of bed next morning for the pain in their legs! You use some muscles you never use. The walk is unique, it’s fabulous and it gives you a wonderful experience if are up to it!! There is no way out. Some run through it in 3 hours, other use 7 and loose the boat and stay the night in Agia Roumeli. It is better to stop and enjoy the faboulous view and the unique nature, than to run ad not see anything! 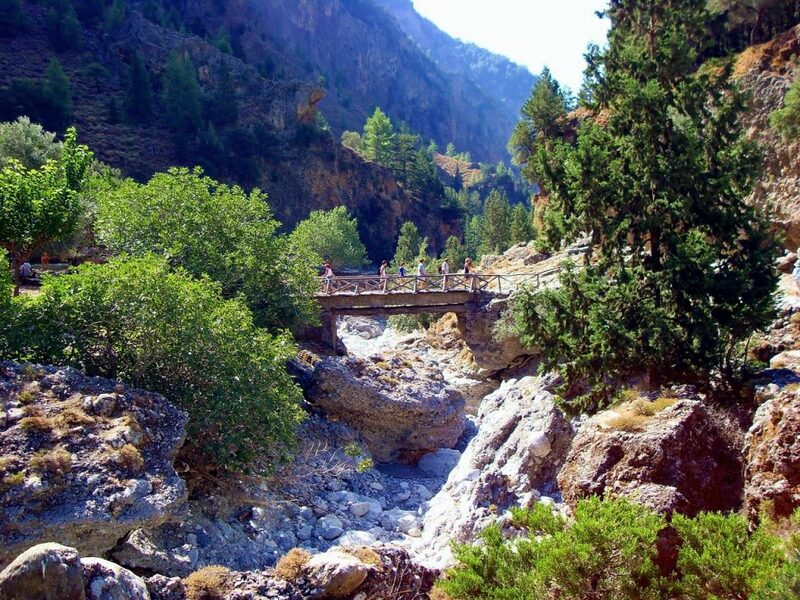 In the middle of the gorge, you find the abandoned village of Samaria a nice place for a break. This place was abandoned once because of a flood. You will find a simple emergency aid and some kri kri goats here. When you finally get down to the end of the gorge, you will find some cafes for a drink and something to eat, or just walk on to the very end untill you see the sea at Agia Roumeli! Take a dip in the sea, it is worth it. Bring extra shoes and swimwear, and have a good meal before you take the boat. It can be busy here before the boats are leaving. The boat trip is also very nice either you go to Sougia or Hora Sfakia. I guarantee you, this is a trip you will never forget! !